Who are The Microphones and what is Mount Eerie? Whether it’s as The Microphones or as Mount Eerie, Phil Elverum has been making swirling, fuzzy, psych-pop records over the last ten years. Laying your hands on even half the stuff he’s ever released is a mammoth task, with 7″s scattered far and wide and LP’s completely sold out by labels who only pressed small amounts in the first place. Your releases have a real cottage industry feel to them, with you often selling directly from your website. What motivates you to do this? There must be plenty of labels around prepared to do this for you. I’ve heard you mention Crass in other interviews before, with relation to your artwork. Is control over your music politically motivated in a punk sense? Was your decision to do this connected to any negative experiences with other record labels? I don’t really have a straight answer for that one. Yes, I am very inspired by the story of Crass, seeing it from afar. I have never been an actual “punk” in the way where I listened to a bunch of “punk” music, but I am inspired by it. I think my tendency towards wanting to do all the work myself comes from my upbringing, raised by West Coast US children of the 60s/70s who valued self-sufficiency and simplicity, and also from the atmosphere of broader punk culture that I developed my artistic and political ideals in. My introduction to “punk” ideas was through the lens of Olympia, Wash. and K Records, which is founded on the idea that punk is a way of doing a thing, not the thing itself, and actually they have a history of pushing what punk can mean into pretty disparate places. So, yes, I suppose it’s politically motivated, just in the sense that that’s the way that makes sense to me. It seems like common sense to me. I also get excited when these same ideas turn up in unexpected places. The stubborn fisherman in the shed, Thoreau in his cabin, anyone who just finds a way to do a thing that seemed inaccessible before. You’ve spoken before about how Mount Eerie is a separate project from the Microphones. I can hear the distinction but I find it hard to put my finger on what makes them different. Maybe Mount Eerie feels more like a band and the Microphones like a recording project… What did you feel had changed that you wanted to start afresh? I was at a point in my life where I felt like I was a different person. I wanted to mark it as different. I don’t know what the difference actually is. I can’t really do anything aesthetic on purpose. I have no real control over the bigger direction. 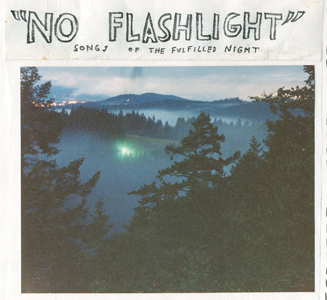 In the album No Flashlight there seems to be this desire to express a really personal experience of the world. The songs feel like a patchwork quilt of ideas that work together to suggest something that can’t be rationalised, only felt. In the sleeve you spend a lot of time writing about what the songs were about. What made you decide to do this? Did you feel that the songs did not go far enough in trying to get their point across or were you just coming at it from a different angle? Yes, I felt like I was trying to express a pretty elusive weird thing, and I wanted to just say everything I possibly could about it so maybe it would be clearer. Also, I wanted the cover to have a bunch of things to hold your attention. How much do you think about your performance when you play out live? I watched that old tour DVD you did with little wings and it struck me that how you were on stage was distinct to how you were the rest of the time when you were relaxing or chatting with people. I saw a show last year at the Luminaire in London, which kind of re-enforced this. Are you aware of any change at all and if so is it a conscious thing? I think it’s inevitable to act different when everyone’s staring at you. I don’t think about the show at all really when I’m touring. I want to be a normal accessible dude. It’s just weird on the mind to have everyone looking at you and I think inevitably a character develops. I try to be myself. Can you talk a little bit about how you go about writing and recording? Do you distinguish between the two processes or do they go hand in hand? Do you sit down and consciously try and write music or is it more a part of your life like eating and sleeping? Do other things ever distract you to the point that music becomes less important for a while? Yes, I become totally distracted. I am usually distracted. Especially now that I’m doing all this other “record label” work. I don’t ever sit down and try to make up songs. They (the words) usually come into my head when I am alone and quiet, often driving, sometimes walking. I used to spend a lot more time thinking of sounds, imaginary weird big sounds that I would later try to create in the studio. Like, later that day, because I had access to this amazing studio all the time pretty much. Now I have my own little collection of recording stuff but I don’t walk around thinking of sounds as much. I walk around thinking of ideas and words more. I am not much of a musician. All of my songs are basically the same chord progression, no matter how hard I try to force them into some other form. I really love the wall of noise thing going on in ‘The Moan’ on No Flashlight. Would you ever try that kind of stuff live? In fact, would you even want to try and replicate your recordings on stage in the first place? If not, what puts you off doing this? I don’t want to try recreating the recordings live. That seems boring and kind of sad, but I do love playing with a loud band. I have done that a bit. The difficulty is that my friends who play music are always busy with their own music, and they live all over the planet. Occasionally it works out to do a tour and I love it. The thing is, I don’t want to have a band that becomes just a normal band. I want it to always be different. Can you tell me a bit about the idea behind the song ‘The Glow Pt 2’. It seems to be one of your songs that has really had an impact on people (including myself) when they mention you. How did it come about? What was the idea behind it and why do you think it stands out to so many people? I don’t remember really. It was about six years ago. I was more dramatic back then. “I faced death” is kind of a ridiculous line, considering that I was talking about having my feelings hurt. The idea with the song is that sometimes it is annoying to have to admit to yourself that you are still alive when you’d rather curl up in a ball and be sad and dark. Being annoyed at your heart for still beating. Not that I was actually suicidal or anything. I totally wasn’t. Just a regular old relationship-not-working-out. No big whoop.